Cloud Ark is a brand name of Medialab Ltd., a UK-based IT specialist and software developer, with over 35 years of computing experience. We design and host websites, provide virtual computing environments and create software solutions for various markets such as the accountancy, legal and financial professions. Our approach is open and honest; we aim to educate clients on how IT services can improve their day-to-day operations, increase security and save money. We pride ourselves on principles of in-depth expertise and uncompromising support and service for our customers. The team is made up of highly experienced, professional people who have a very wide skill-set. Our founder and CEO began with computers as a teenager, and has seen many technologies come and go. Over the past ten years he has specialised in Cyber Security and Systems Protection, both as a consultant and advisor. Our Head of Sales has been at the helm of a number of companies, for over 40 years. His roles have consistently been in customer facing sales and support, giving him the skills to be able to comprehensively understand your needs. Our I.T. Head has over 30 years of experience with computers. He has a comprehensive analytical understanding of programming, frameworks and systems as well as networking and security. Working alongside them is a dedicated team of sales and support staff who are ready to accept the challenges you may face in the world of I.T., and willing to patiently go the extra mile with you. 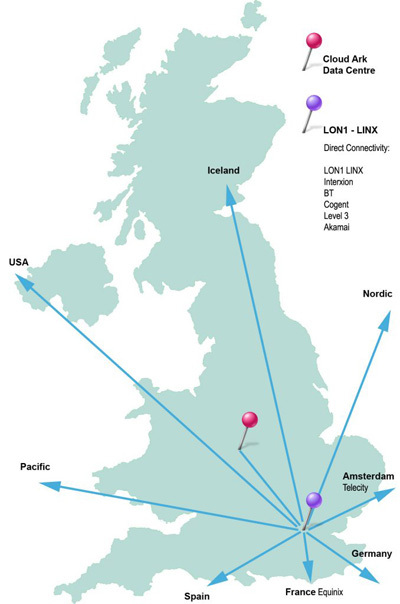 The Cloud Ark Data Centre (CADC) is based in the heart of the UK, providing an excellent central location. The building is practically a fortress with incredible levels of security and resilience built into the complex. Connectivity to the backbone of the internet is second to none, peering with giants such as Cogent, BT, Telia, etc. Businesses cannot afford to lose time or money to downtime. Our data centre facilities are equipped and managed with the latest and most rigorous technologies and procedures, which means that your systems are always running and available.